If you asked a random stranger from outside the city about Rotterdam some 5 to 10 years ago he or she would problaby have answered your question with a facial expression telling you: ‘I’ve no clue’. In the recent years Rotterdam has become famous, especially the centre. The Northen part of the city is still a black box for many locals and visitors, like the city was some years ago. SPECK is one of those places you won’t find by just wandering around. Some months ago while cycling back home after a nice dinner at Tosca I spotted one of those small cosy restaurants in the neighbourhood. The spot was closed already but a peek through the window was enough to make me realise I had to come back another time. 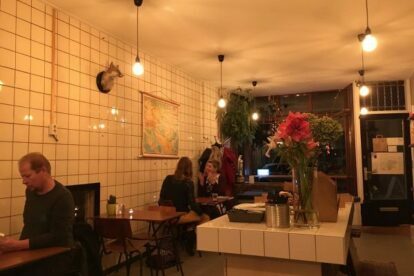 A bunch of small wooden tables, some stuff on the shelves, on the wall and the most interesting piece in the back, a huge stone oven. A little voice in my head told me ‘this must be good’. After a few visits I can honestly tell you that the voice in my head was completely right. It is good. SPECK serves a small menu with different kinds of dishes, of course, from the oven. The pizzas are great but the meat is delicious too. Always a hard choice. For a drink you can get a good house-wine, all for a reasonable price and served with a smile. You can’t reserve a table, just walk by.